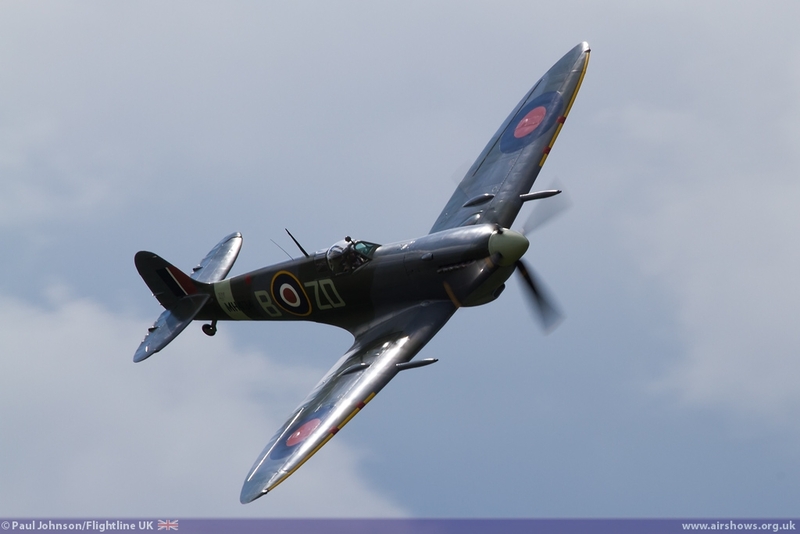 Old Buckenham is a pretty village hidden amongst the beautiful Norfolk countryside and it is very hard to believe that 70 years ago the Village was next to what was a sprawling USAAF air station housing heavy bombers. 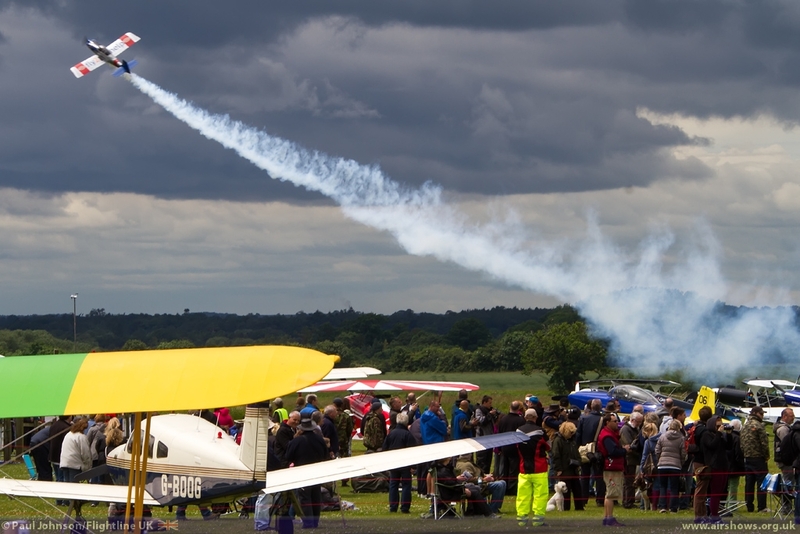 The modern airfield occupies just part of the original military airfield utilising the runways and just some of the many access roads which disappear off into the surrounding agricultural field. 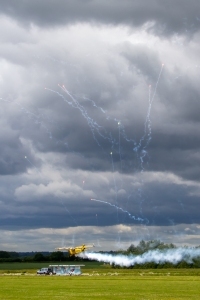 The 453rd BG flew 259 missions dropping 15,804lbs of ordnance. 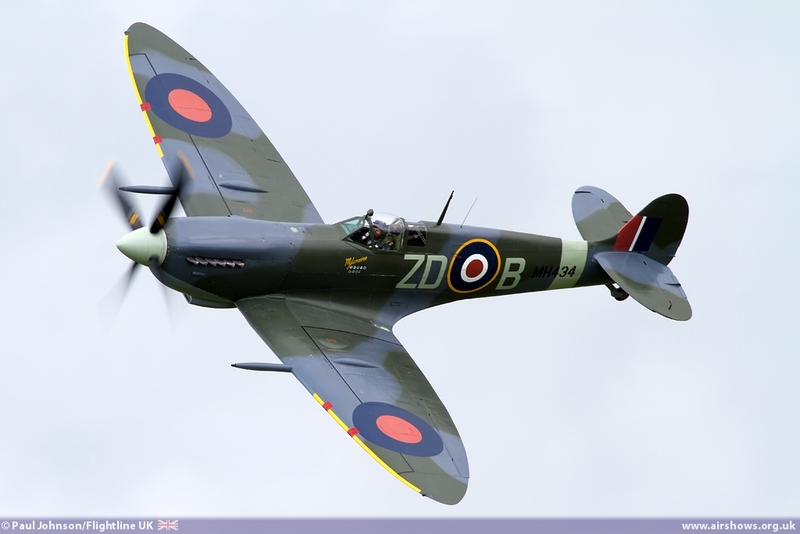 58 aircraft were lost and 366 airmen were killed. 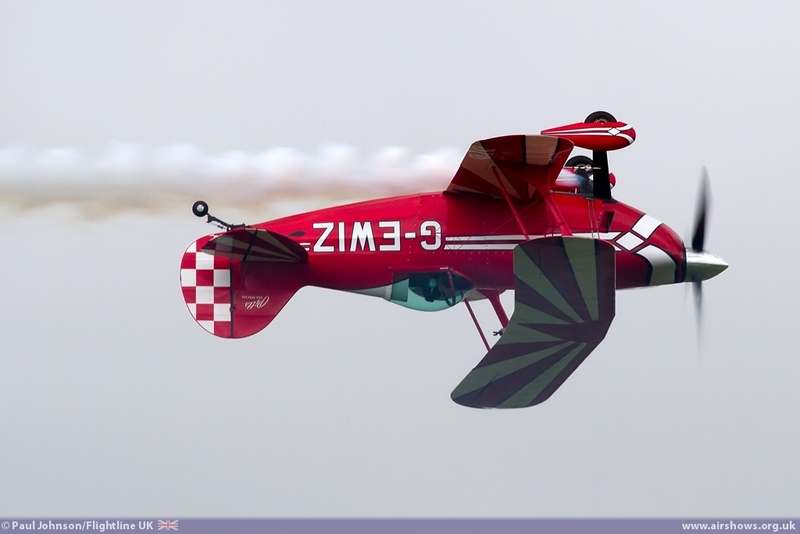 They are marked by a beautiful memorial stone situated just outside of the clubhouse. 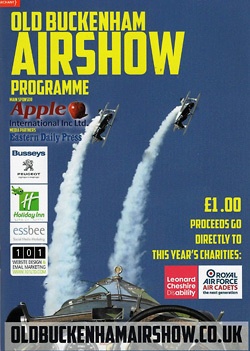 Today East Anglia still retains strong links with the United States Air Force with RAF Lakenheath and Mildenhall housing several American units. 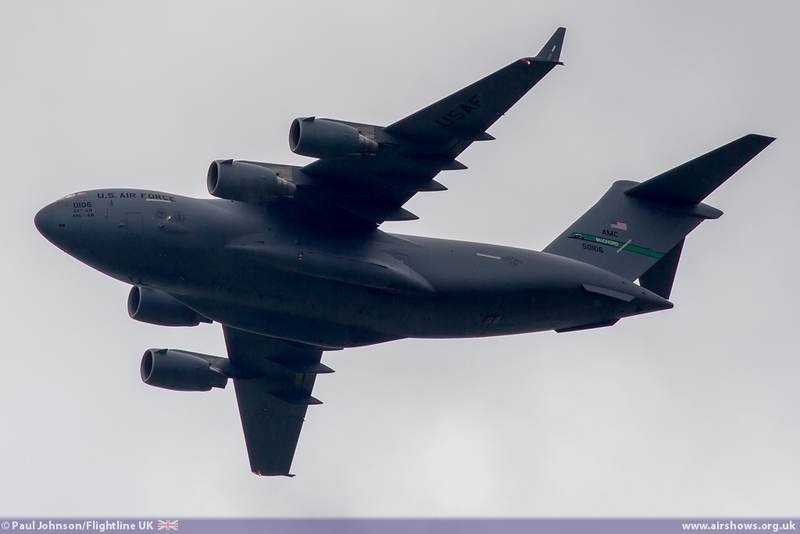 They were even in evidence during the airshow when one of the many USAF C-17A Globemaster IIIs that pass through Mildenhall flew low under the clouds right over Old Buckenham. 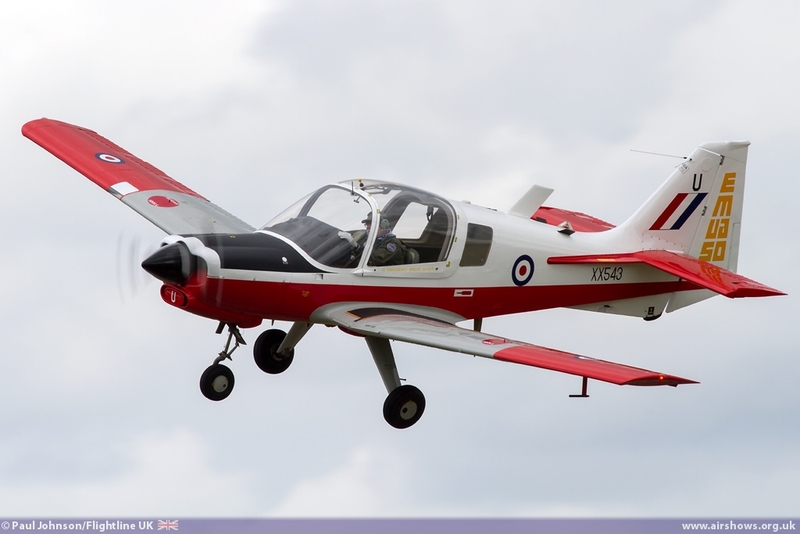 The Royal Air Force is still present with flying stations at RAF Marham and Wattisham, the latter also housing the Army Air Corps. 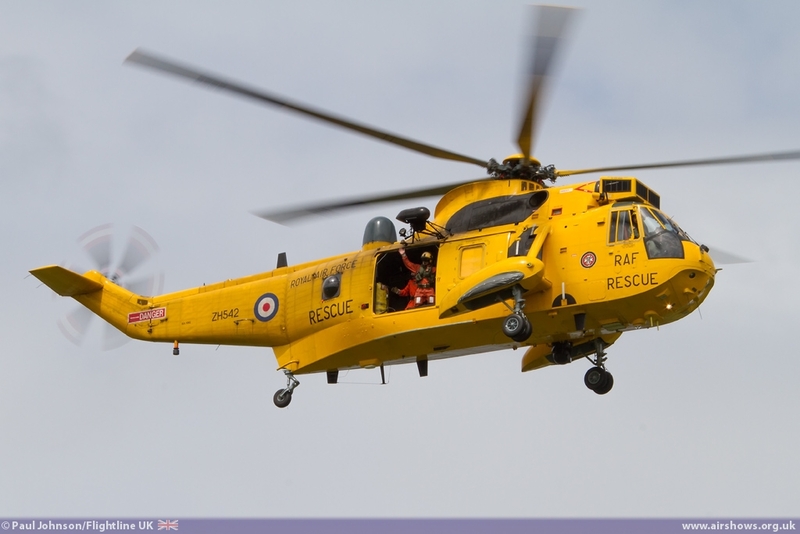 A surprise addition to the flying displays was a flypast by a Wattisham based Westland Sea King HAR3A. 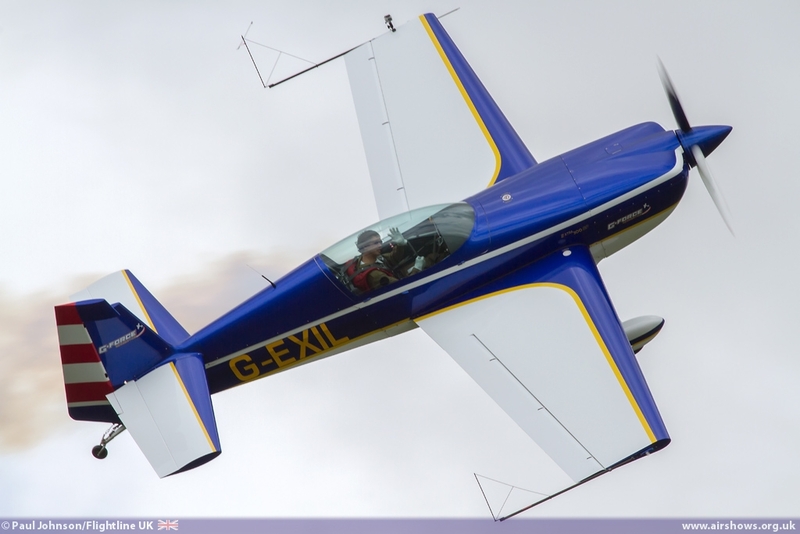 The flying display proper got underway with the RV8tors team of Alister Kay and Andy Hill. 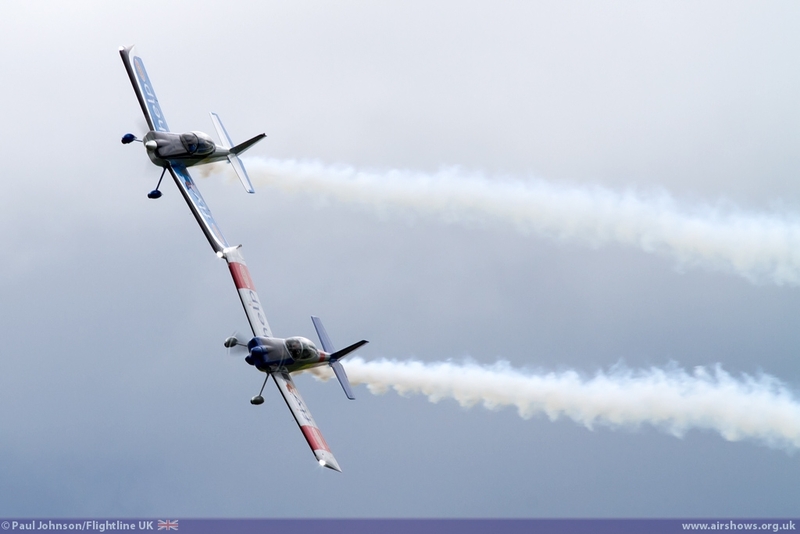 Flying the Vans RV8 the team always put on an impressive display of formation and opposition aerobatics in their powerful aircraft which now sport very bright LED landing lights in their wingtips. 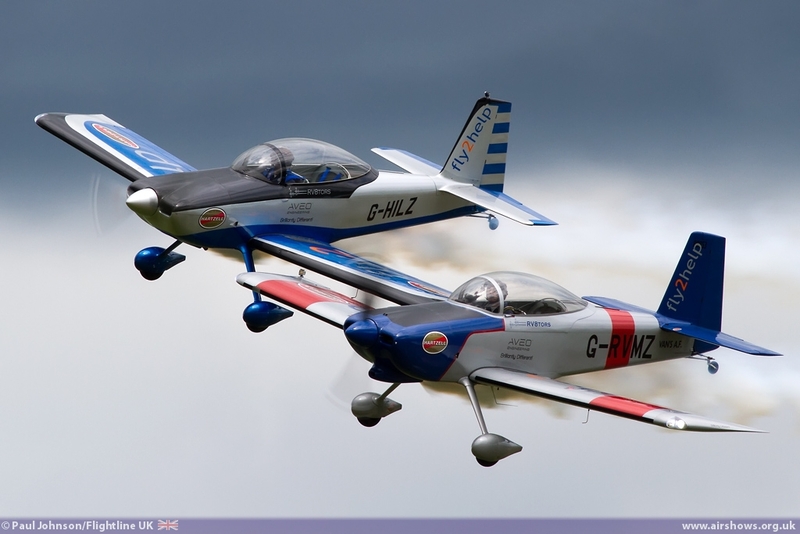 The RV8tors were the first of a whole host of aerobatic routines, many of which came from Anglian region. 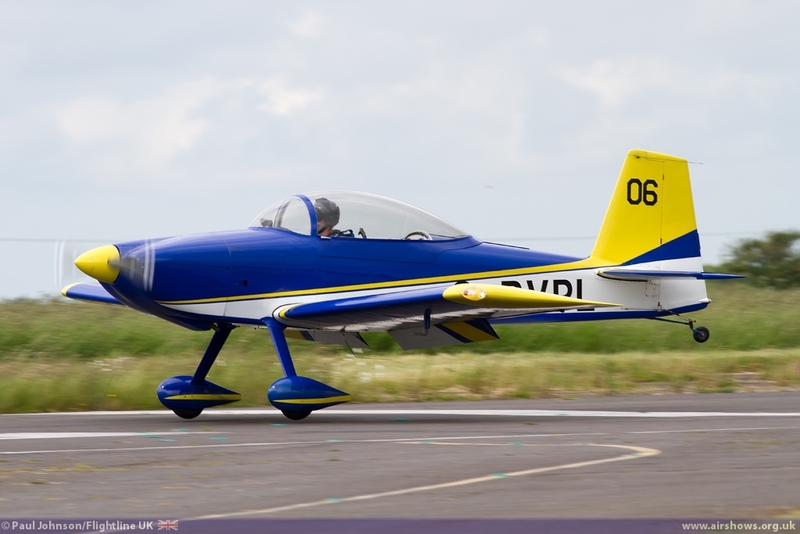 A further Vans RV8 was displayed by Matt Summers who performed his first public display at Old Buckenham last year. 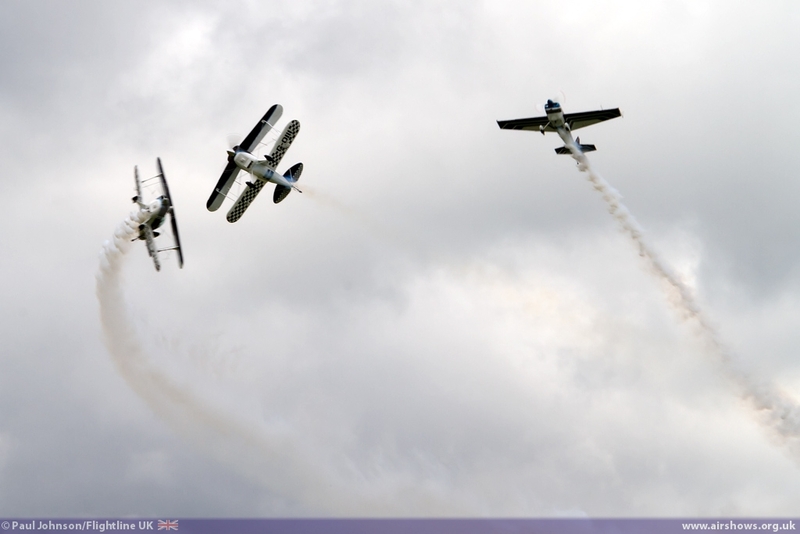 The Pitts Special certainly featured very well in the flying displays with solo and team displays. 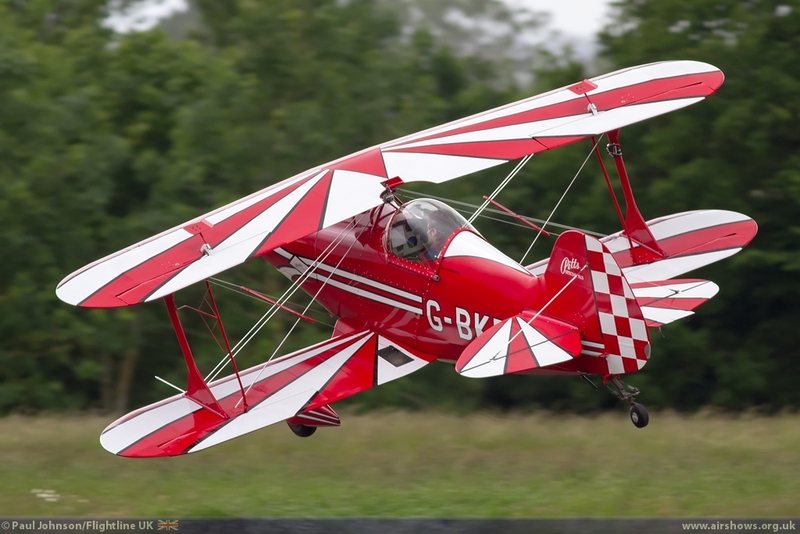 Lauren Richardson put in a fine performance of precise aresti-style aerobatics in her lovely Pitts S-1S. 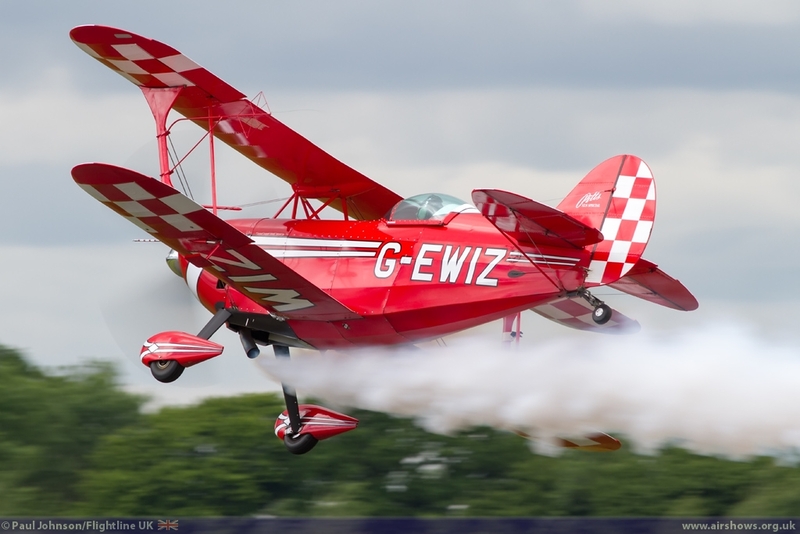 Later the flying programme Rich Goodwin displayed the much bigger and more potent Pitts S-2S G-EWIZ. 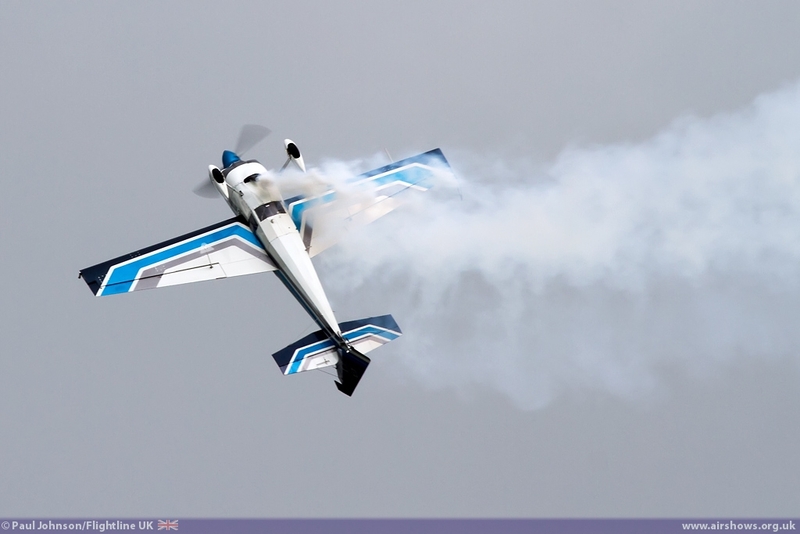 The difference in performance is startling with Rich capable of flying some dramatic tumbles and using the pure power to hover and climb away from slow speed figures. 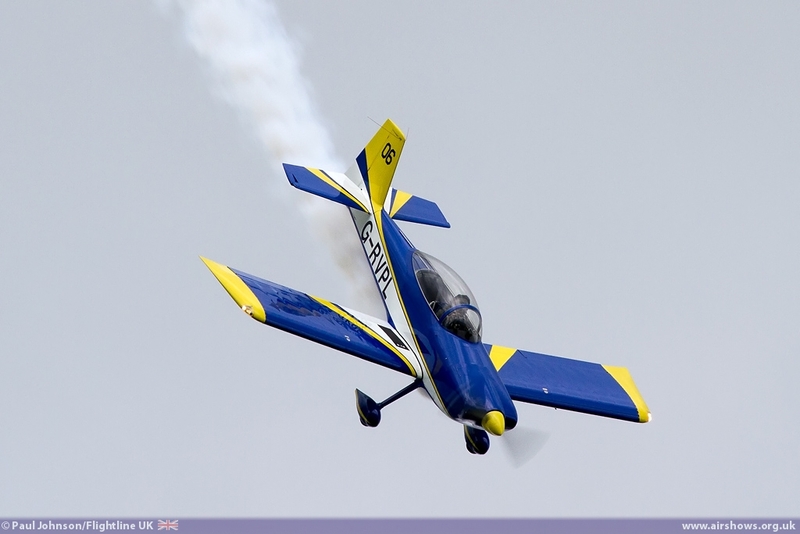 Further Pitts action came from the Wildcats Aerobatic Team. 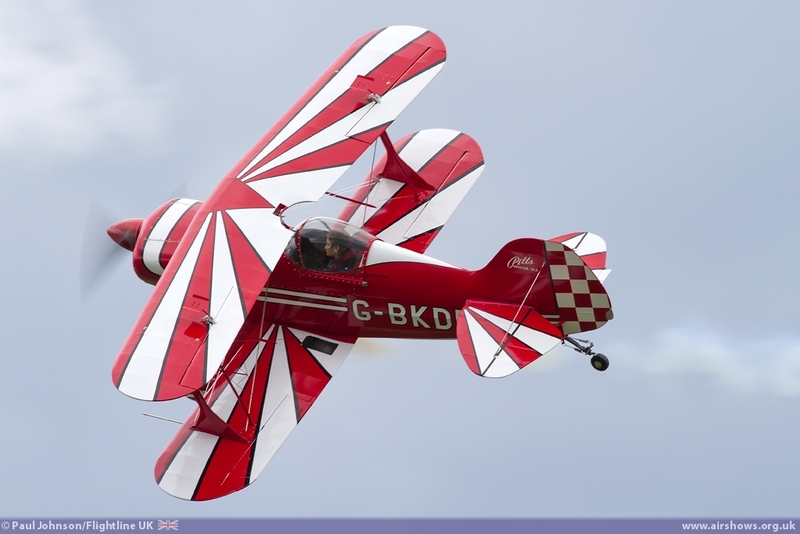 The team started life as a Pitts Special duo flown by Al Coutts and Wilie Cruckshank. 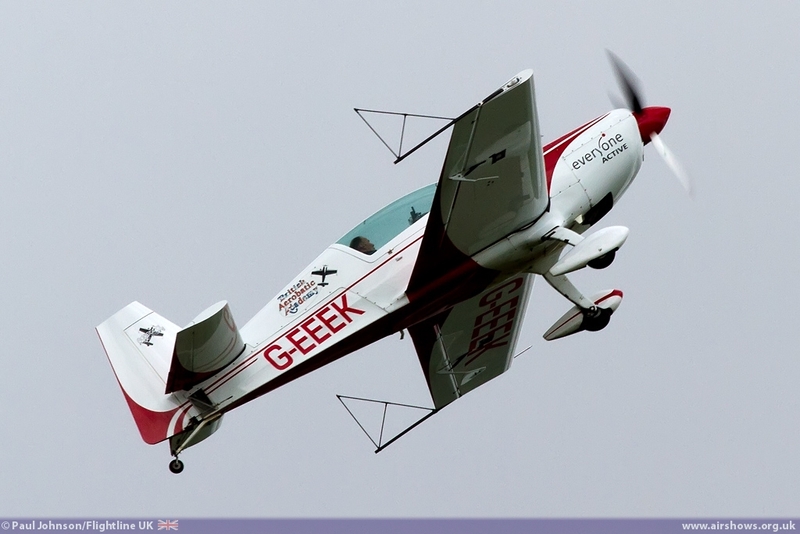 For 2013 they’ve added the Edge 360 to the line-up flown by UK Advanced aerobatic champion, David Jenkins. 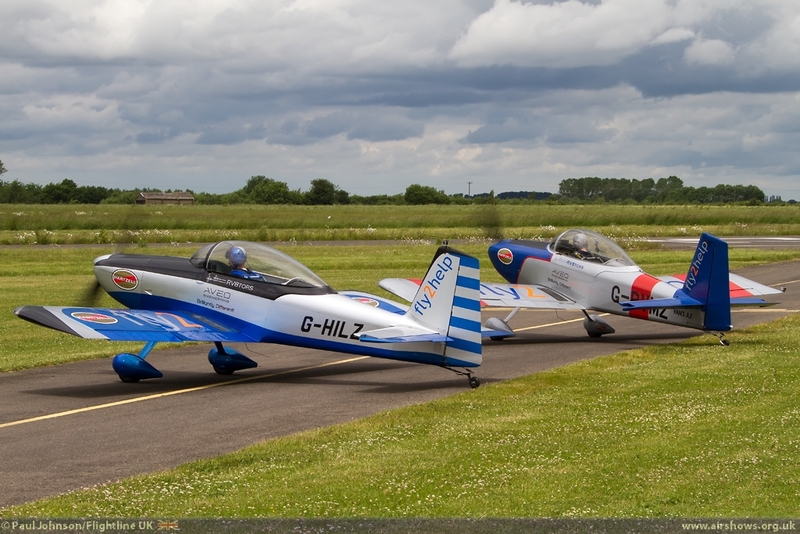 The team’s aircraft are very well presented wearing smart black, blue and white schemes that perfectly fit the classic lines of the Pitts Special and the more modern looking edge. 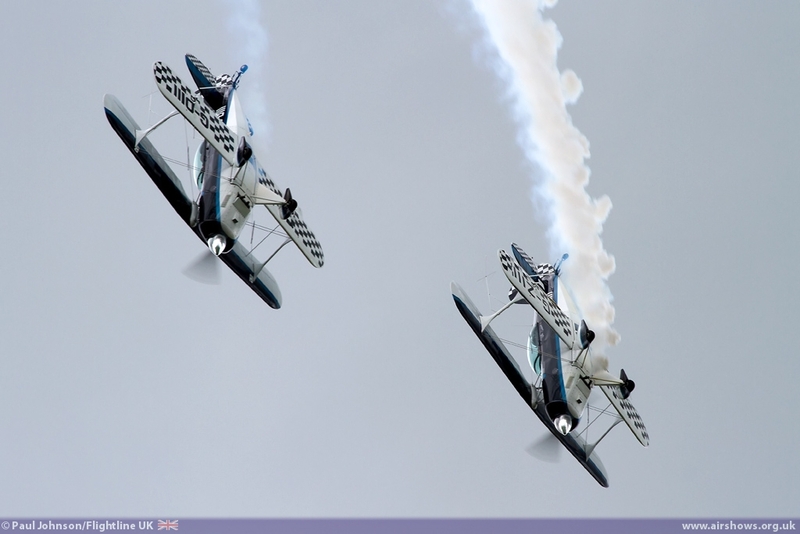 For their display, apart from a brief opening break the Edge and the two Pitts operated separately with some superb solo aerobatics from the Edge while the Pitts pair performing close formation and opposition figures. 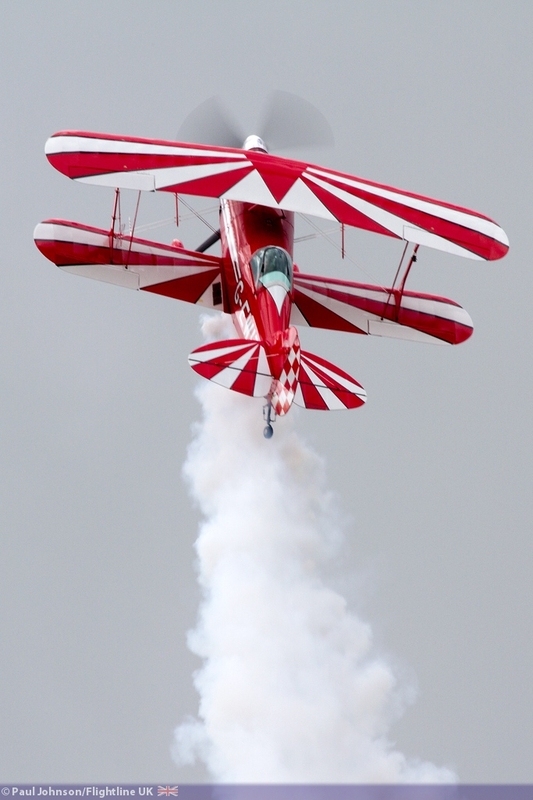 Examples of the latest aerobatic hardware came from the Walter Extra stable. 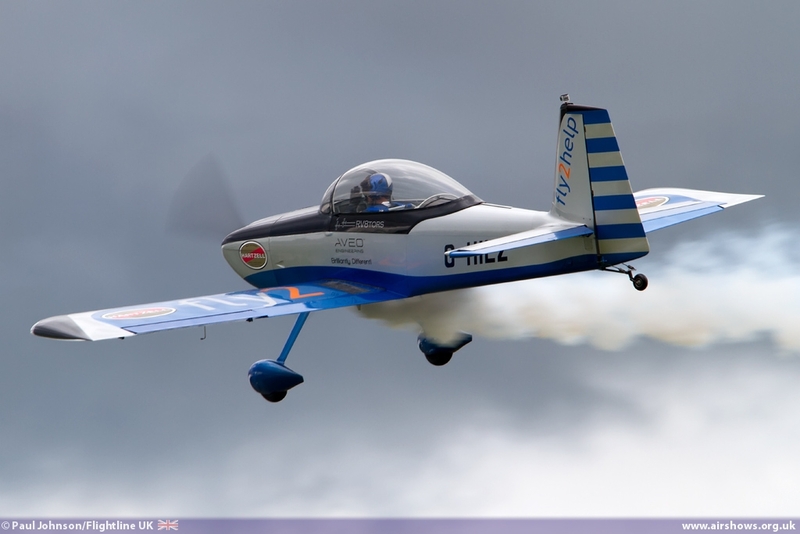 Adrian Willis displayed his Extra 200 aerobatic training aircraft. 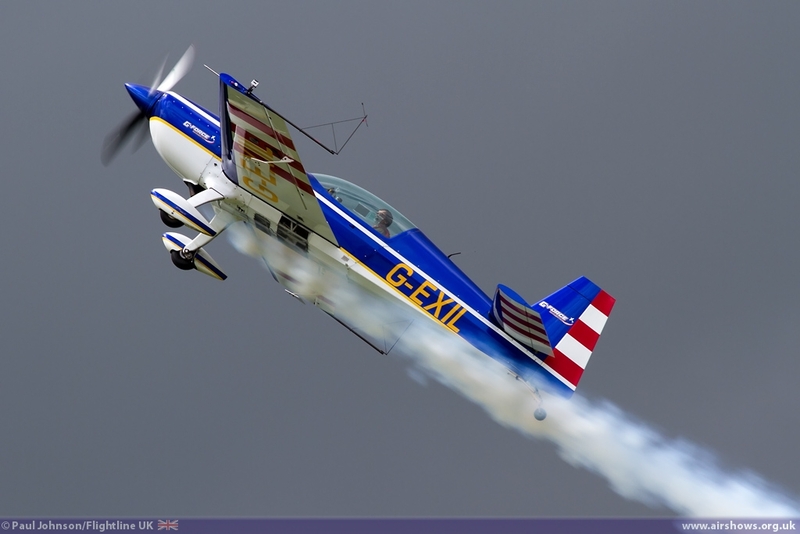 Adrian is an aerobatics instructor based at Little Gransden with the British Aerobatic Academy. 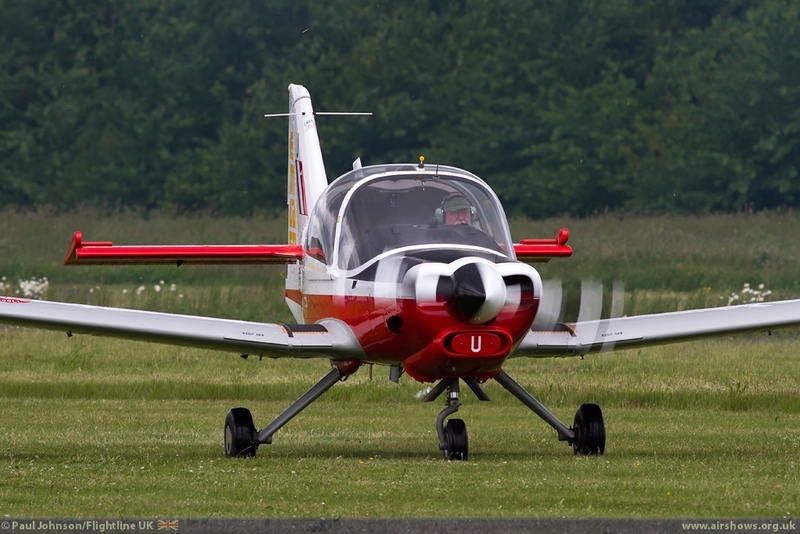 The Extra 200 is a smaller version of the famous Extra 300 with just a 200hp engine but retains the trademark shape of Walter Extra’s designs. 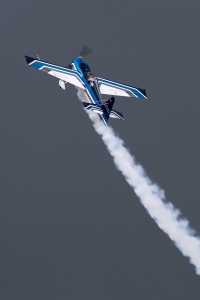 The bigger, more powerful and capable Extra 300S was displayed by Chris Burkett who put on a tremendous demonstration in this aerobatic thoroughbred. 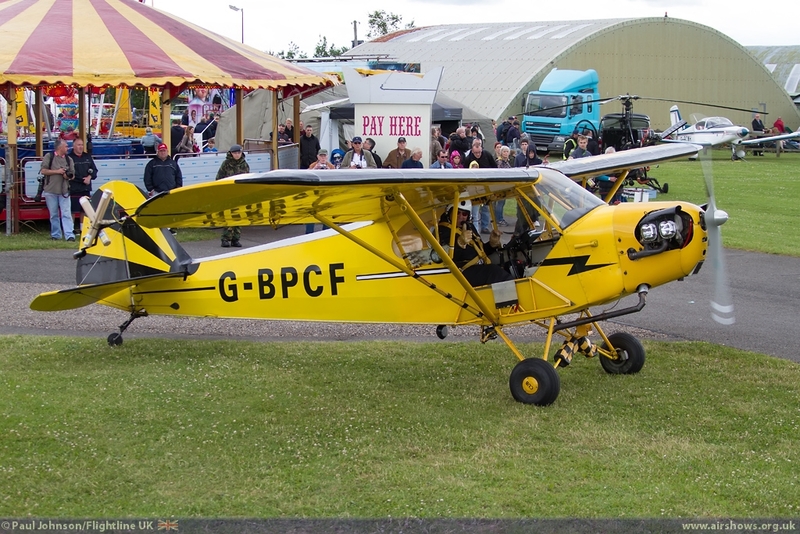 In contrast to the noisy aerobatics was Brendan O’Brien who attempted to land his Piper J3 Cub on a specially adapted trailer. 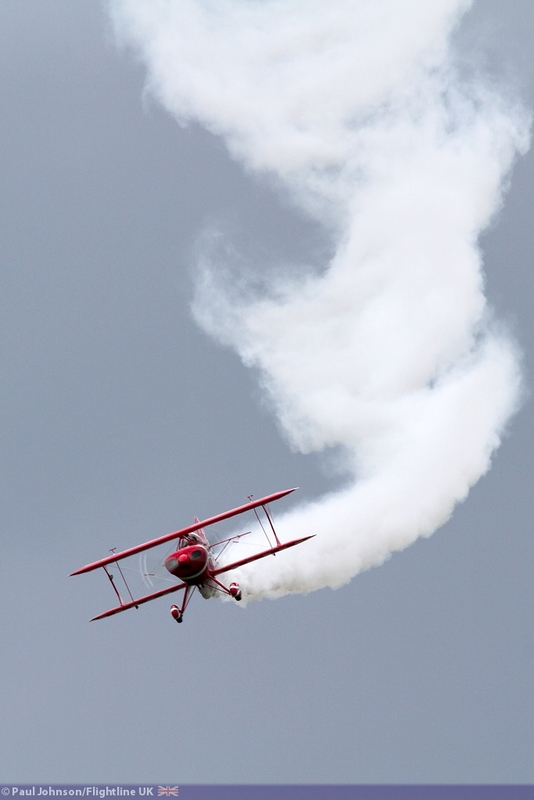 His act is always popular at the major airshows and perhaps even more so for the Old Buckenham crowd who “Oooo-ed” and “Arrrrr-ed” throughout his crazy flying routine. 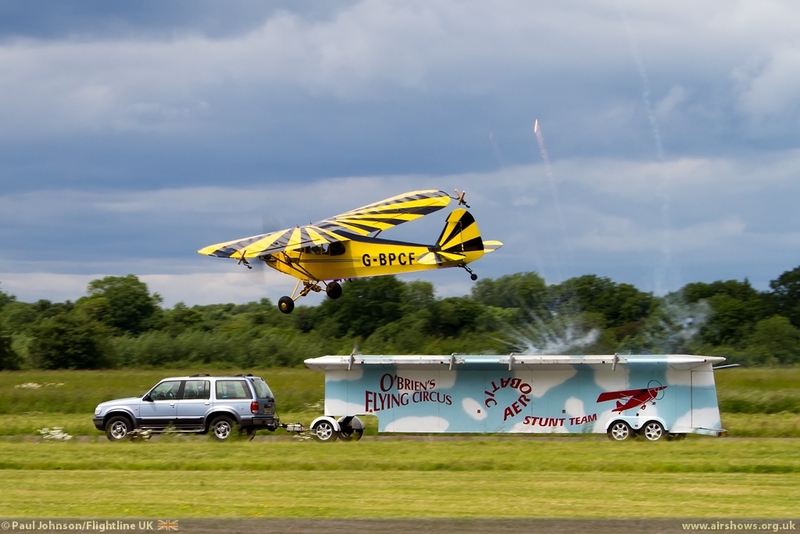 With Old Buckenham’s 600m runway, it was the shortest runway Brendan has attempted the trailer-top landing on but sadly the stiff breeze defeated him this time – there is always next year! 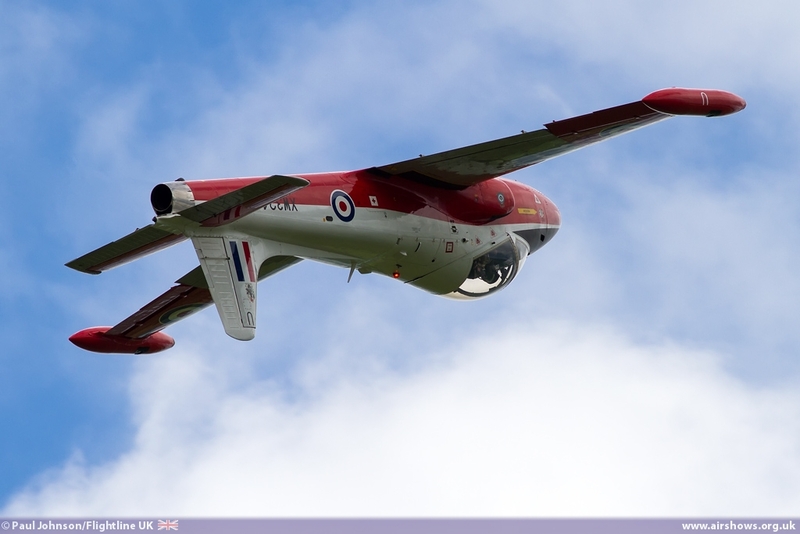 Historic military aircraft also took part in the flying. 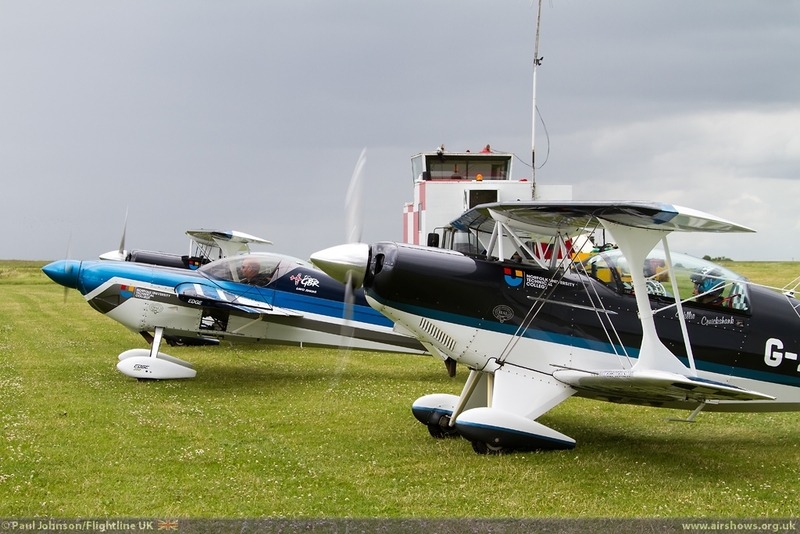 Old Buckenham itself is home to some including the Stinson L-5 Sentinal and Boeing Stearman PT17 Kaydet of Gerry Honey; the latter was giving trial lessons throughout the weekend. 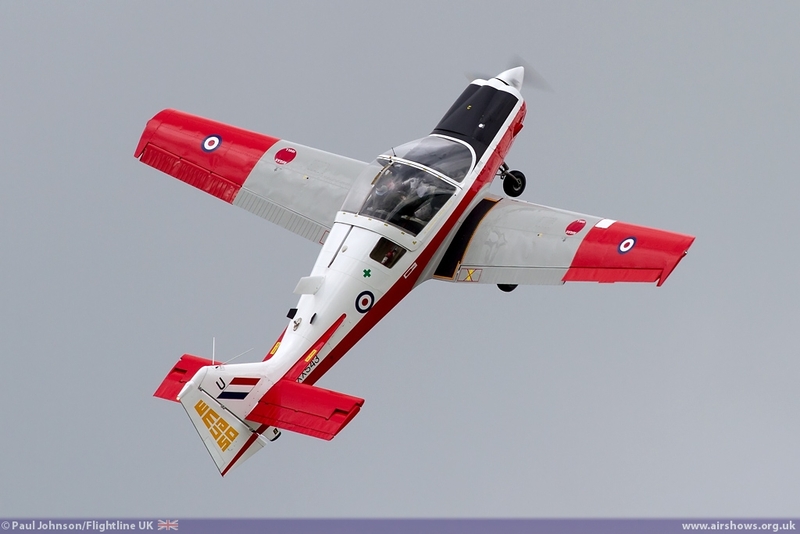 In the displays, Rod Dean displayed the Duxford based Scottish Aviation Bulldog T1 which wears the markings of East Midlands University Air Squadron. 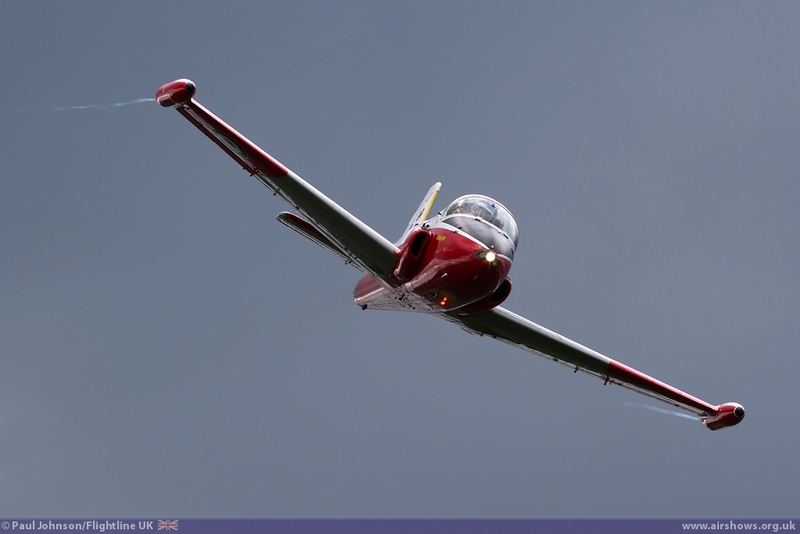 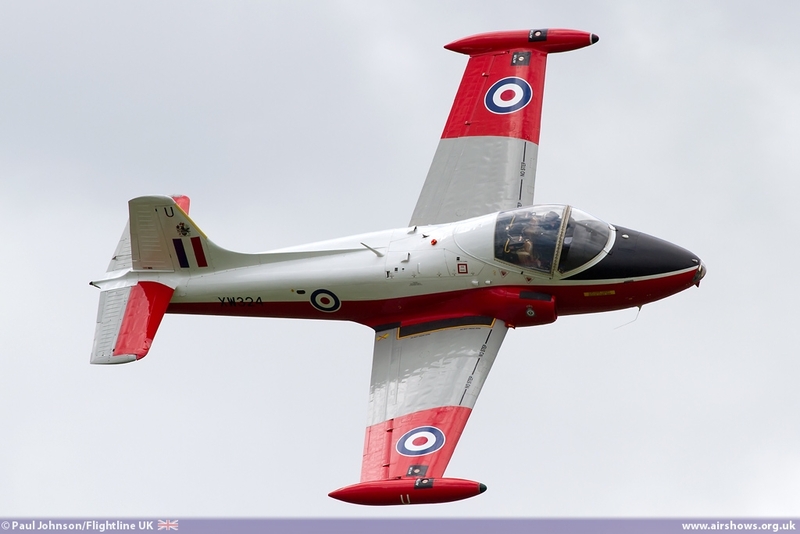 Later in the day, Andy Hill returned in the wonderful BAC Jet Provost T5 owned by Jeff Bell. 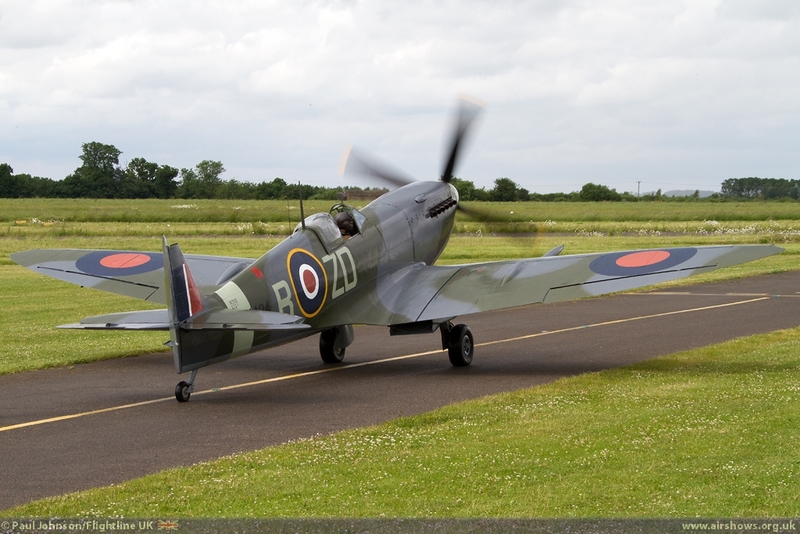 This particularly aircraft is kept in pristine condition and it has won many awards! 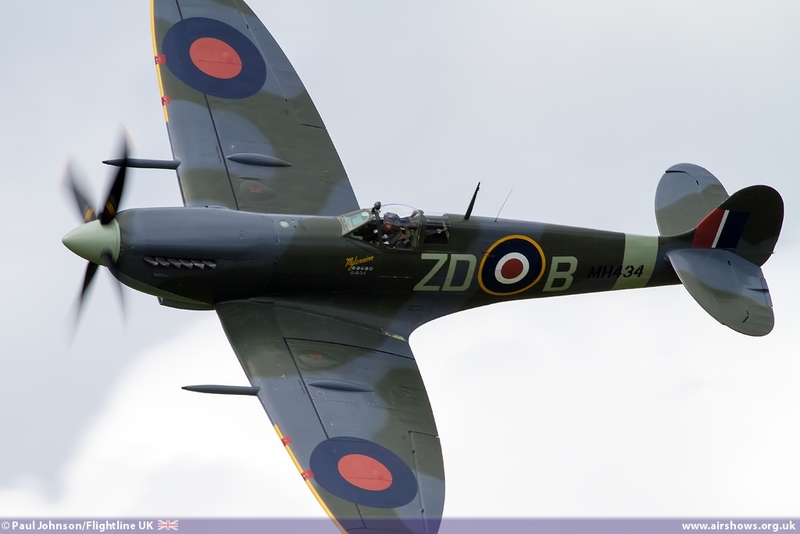 There could be no better finale to the display than the Old Flying Machine Company’s Supermarine Spitfire LFIXb MH434 flown by Steve Jones. 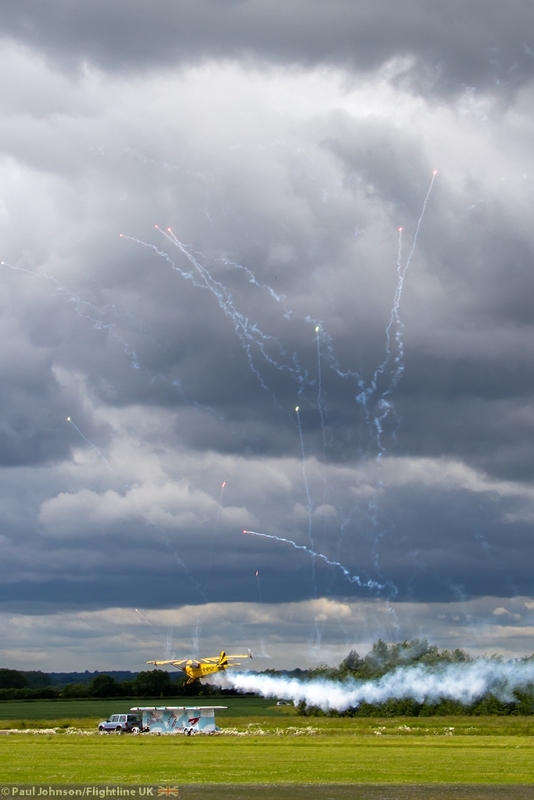 Despite the rain, quite a crowd gathered around the Spitfire as Steve prepared the aircraft for the display which is of course was beautifully flown! 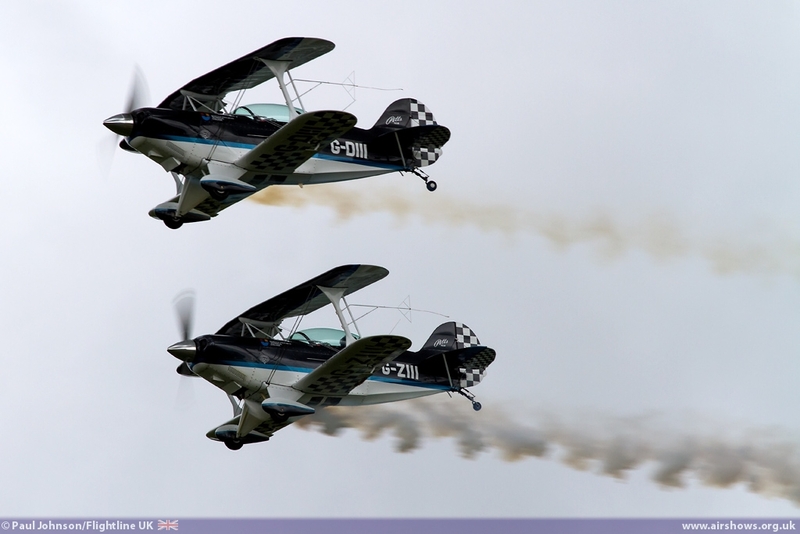 I hadn’t been to an Old Buckenham Airshow for a while, and the 2013 certainly did not disappoint with some great flying and a great atmosphere. 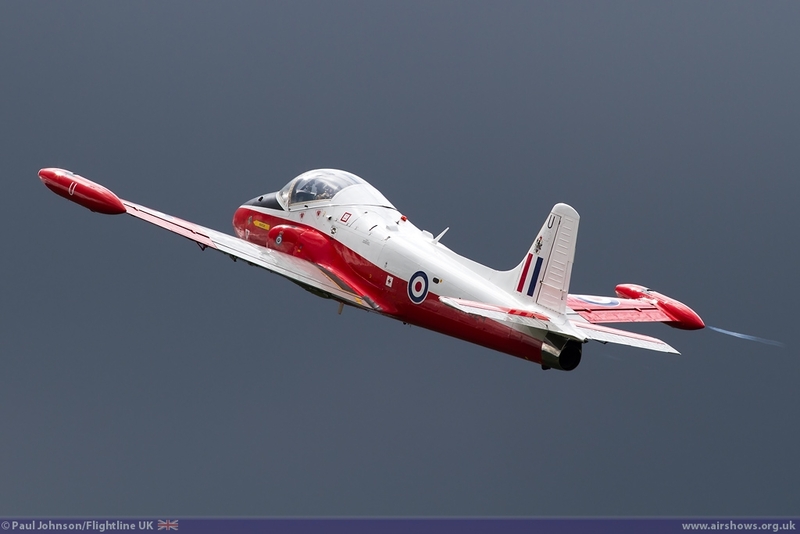 The pilots who displayed deerve particularly praise coping admirably with the stiff westerly winds and rain showers that hit Old Buckenham throughout the day.